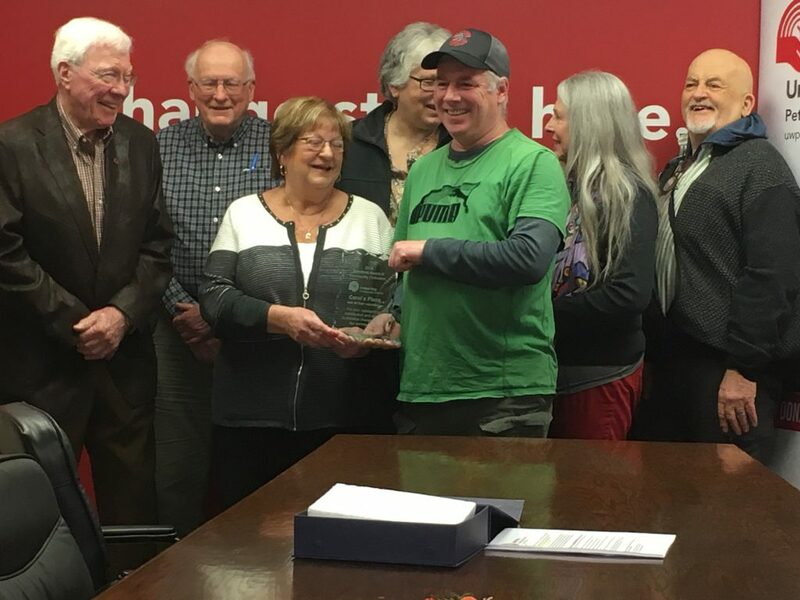 United Way of Peterborough & District today announced the 2019 recipient of the Scholfield Award of Community Distinction. The annual award was established to recognize an individual or organization for their outstanding contribution and ability to mobilize change within the community. The 2019 recipient is Carol’s Place, in particular, their volunteers. Carol’s Place is a gathering place for people that was open in the morning and early evening, in the hours when local hot-meal programs and overnight shelters were closed. It was named in honour of Carol Winter, who devoted her life to helping the homeless, the poor and the marginalized in Peterborough. It was her dream to create a place where people in need could go, at any time of day. Carol’s Place was a safe and inclusive place for anyone to gather. They provided a listening ear and information about services available. They also have a supply of donated clothing and items (camping supplies, first aid kits, insect repellent etc.) for those who need them. At Christmas time, they donated backpacks filled with supplies to those in need. It was operational until December 31st, 2018 when they were evicted from their location at Peterborough Square. Dan and other volunteers are currently advocating and fundraising to find a new location. The volunteers who have made Carol’s Place possible include: Dan Hennessey, Judy Jordan, Glenn Goodberry, Susan Gontier, Darlene Boyle and Janet Wilkins. Past award recipients have been Bill Strode, John Martyn, People First, Survivors Abreast, Marie Bongard, and Roy Brady, Stephen Kylie, Faith Dickinson and most recently Marion Burton.